2005 CHEVY COLORADO LS Z71. 3.5L 5 CYLINDER, AUTOMATIC, 4X4. POWER WINDOWS, LOCKS AND IRRORS, SUN ROOF, AM/FM CD, COLS AC, ALARM/KEYLESS ENTRY, TINTED WINDOWS, TOW PACKAGE, TONNEAU COVER AND BED LINER. CLEAN TRUCK. 113K MILES. 90 DAY/3000 MILE WARRANTY INCLUDED. ALL FOR $8995. 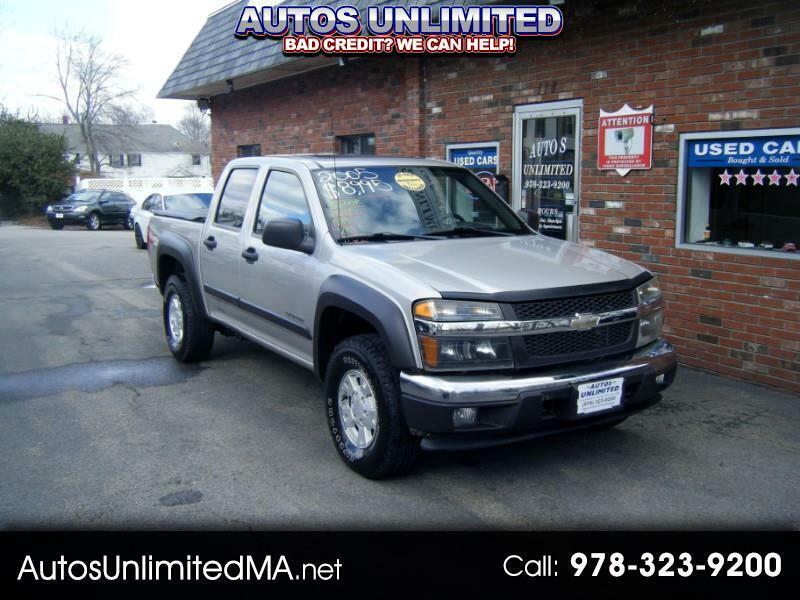 FOR MORE PICTURES AND INFO PLEASE VISIT AUTOSUNLIMITEDMA.NET OR CALL AUTOS UNLIMITED 978-323-9200. IF YOU PREFER TEXTING PLEASE TEXT 978-726-4107. THANK YOU.